"We have all heard our own children, or stories of other children, singing parts of the Divine Liturgy when they were either playing at home or singing in the car when they thought no one else was listening," explains Liz McMillan, Choir Director at St. Elias in Atlanta. Liz has capitalized on that natural love for music through her work with two Archdiocese Departments, Christian Education and Sacred Music; for years, she's taught seminars and written about how to introduce church music to children. Sacred Music recently published her groundbreaking resource guide as a PDF on their webpage. 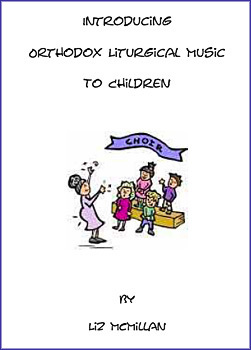 Titled "Introducing Orthodox Liturgical Music to Children", the two versions of the manual (Pre-school to 6 year olds and 7-12 year olds) cover concepts such as how to explain to kids why we sing the music we do, and how to structure music class time. Antiochian.org interviewed Liz McMillan to find out why she dedicates so many of her volunteer hours to working with children and church music. 1. Tell us a little about your background, and how you came to be so involved in church music. I started singing with the adult choir of my parish when I was 8 or 9 years old. I grew up singing in Sunday School and was a music major in college. I would say I fell into the music job in my own parish, eventually working with the children there. When His Grace Bishop Antoun visited our parish he was amazed at how our children sang. He told Christian Education Director Carole Buleza about me, and Carole got in touch with me in the early 2000's. At that time, Carole told me, "Liz, people are begging for music curriculum. You have the knowledge and I know how to write curriculum." That led to a meeting between Carole, another church musician-Kh. Joyce Black-and myself. Before the Sacred Music Institute that year the three of us mapped out the curriculum and built upon the model of what I was doing in our parish. As to this recently published manual, I wrote this initially for the Department of Christian Education. Two years later the Department of Sacred Music picked up all the music, computerized and put it all together, and then eventually decided to publish it online. 2. What work have you been doing within the Antiochian Archdiocese to further the cause of children and church music? Well, I teach workshops at the Sacred Music Institute, and I've taught for two years as a part of the Christian Education Institutes as well. I also took a video of myself conducting a class, and also recorded my voice singing the music to make it easier for teachers to learn and teach the songs accurately. Currently, Sacred Music is developing a three-pronged approach to children's music. Prong one teaches all children the music in the Sunday School context. In prong two we're working on a model for families and parishes to be involved in a junior choir program, and prong three is a teen program. 3. Why does it matter whether or not we teach our kids the music of the Church? It is so important for kids to learn church music. How did we learn the ABC’s? Through singing! We learn many things through music, there's so much opportunity for teaching. I’m not about big programs or plays, but about simple tasks, such as having the kids sing during the communion hymn. I am working with my youngest group up to first grade, and they are singing the troparion to our saint. As we do so, I always talk about the words of the troparion, and the parents are telling me their children are learning them. One four year old's mother recently found her sitting at the piano and picking out the melody to the Troparion of the Nativity of Christ. Kids are like sponges. They will learn, and they will understand what they are singing. 4. What suggestions would you offer to those teachers and parents who want their kids to learn Church music but don't know where to start? Be careful not to make it too hard. Stick to the curriculum music in the beginning. Follow it step by step. Keep it simple. It’s got to be an easy simple melody. And have a fun song to warm them up with. Kh. Joyce Black said about her children's choirs, "I don’t dumb my kids down. I teach them real music.” As Orthodox we have so many beautiful melodies. It is important that the children become familiar with these melodies. Pick the melodies you think kids would like to learn. Start with the troparion for your parish and the eight resurrection troparions, then add in other feast days. Divide the readers and non-readers into two groups. Remember, a skill learned as a child will only grow in adulthood.